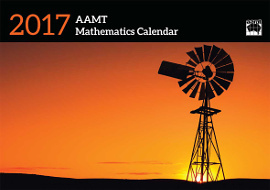 The Australian Association of Mathematics Teachers (AAMT) has published an annual mathematics calendar since 2003. These follow the style of the Problem Pictures CD-ROMs pairing photographs with questions and problems. They can be used and enjoyed at different levels by mathematicians of widely ranging ability and age. The calendars have 13 photos with activities and questions. They are A4 size opening to A3 size (297 × 421 mm) when hung. They are usually published about October. They are sold by AAMT and Badsey Publications. 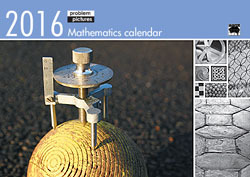 Here is information about back numbers of the Problem Pictures Calendars. 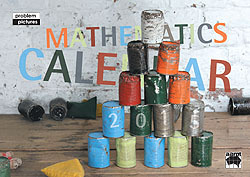 The calendars are printed in full colour and were designed by Jacquie Sprott and Toby Spencer. Between 2003 and 2016 all photography was provided by Richard Phillips. The support of Will Morony and the AAMT team is gratefully acknowledged. Sorry - these posters are no longer available from Badsey Publications but still may be ordered from AAMT in Australia. Links to this website should be to: www.problempictures.co.uk. The photographs and screen images on this website are copyright and may not be reproduced without permission. Problem Pictures calendar and Problem Pictures posters. Copyright © Richard Phillips 2001/2015. Page updated 4 November 2015.